He's one of the most controversial politicians in Sweden at the moment. 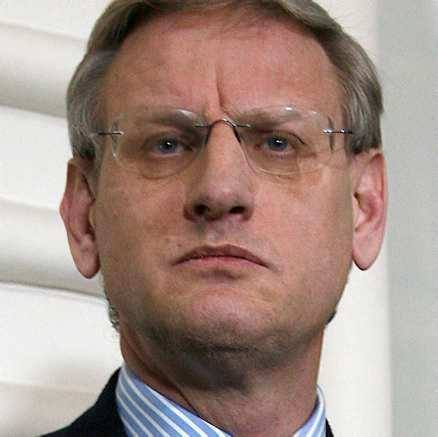 Carl Bildt, Sweden's Foreign Affairs Minister was in trouble today as activists mobilized people to take the streets & protest against him. They want him to "Irhal", resign from office. The demonstration took place in several cities in Sweden; not only in Stockholm. As I'm a resident of Stockholm, I joined the protest and made the following clip below. Well, there are a number of grievances Swedes have against him. I've been here for 7 months and I already have couple ones! I didn't like his stance against Syria and I think he didn't stand up very well to the Swedish journalists jailed in Ethiopia. uh! this feels irritating as I have met him in person once, during the Nobel Peace Laureates seminar in Stockholm. With the awfully freezing weather, I can say the demonstration was a success. Around 3 hundreds or so people showed up! I met with Summer, Swedish-Iraqi young lady and she told me she was protesting for many reasons but most importantly protesting against Bildt stance against Syria.